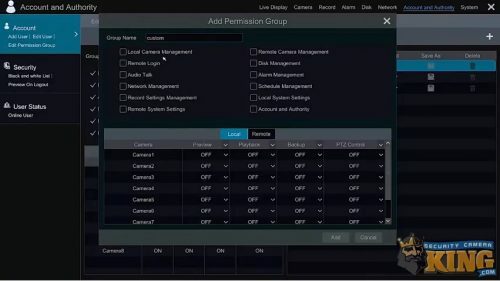 This article will provide the user with a tutorial on how to add users and assign privileges at the local interface of a Sibell recorder. To purchase or view more information on the key features and specifications of a Sibell recorder, visit our entire Sibell Series Collection. In addition to a Sibell recorder, you can also find some of our most popular security cameras and related surveillance equipment to complete your surveillance system. You can read more related articles on Sibell equipment on our website (like how to set up Sibell Mobile on a mobile device). And be sure to follow along in the video provided below if you are having trouble. Let’s begin. 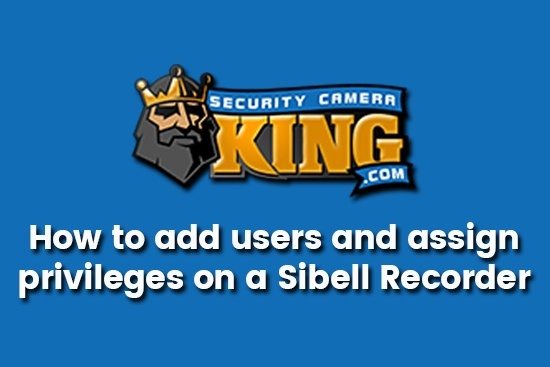 Here are the simple steps for adding users and privileges at the local interface of a Sibell Recorder. First, select the Start icon in the bottom left-hand corner. Once the Start icon is selected, click Settings. Now, select Edit Permission Group under Account found on the upper-left corner. Next, locate and select the Plus (+) icon in the upper-right corner. Once this is selected, enter the Group Name at the top. Then, select the settings which you wish to enable or disable for the group. 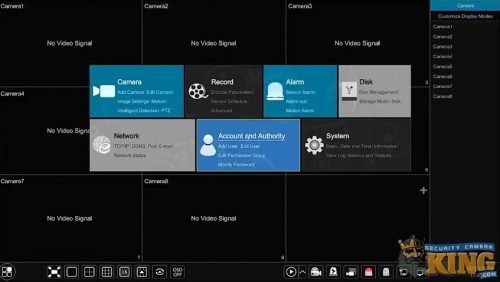 These settings offer you a number of different options, such as Remote Login and Local Camera Management. Additionally, you have your cameras and the option to modify Preview, Playback, Backup, and PTZ Control. 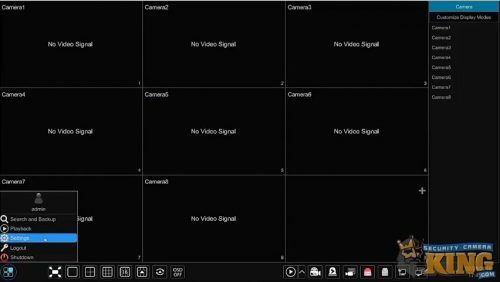 You can turn any of these on or off for multiple cameras at the Local or Remote displays. Once you have made the selections you want, select Add to save them. Once the custom group is saved, you can now add a user. Select Add User at the top-left corner, found under Account. This is to name the custom group you just created so that you can use it as a custom template. 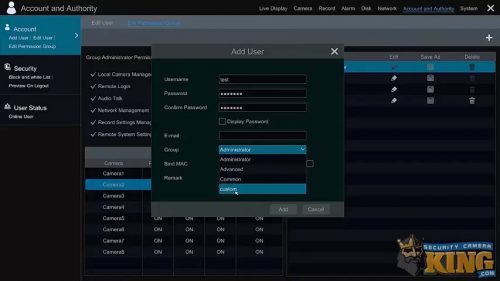 Simply enter a Username, create a Password, and then confirm the password. Then, next to Group, select Custom. Once you have selected Custom, make sure you select Add to save it. And that’s it. That is how to add a user to your Sibell recorder at the local interface. I hope this article has been helpful and answered any questions you might have had. If you are interested in watching other videos on security cameras, DVRs, NVRs, or related CCTV videos, go to our Video Vault. There you can find side-by-side comparisons, more walkthroughs, unboxing products, product reviews, and more. You can also view all of the security cameras, video recorders, access control equipment, and security system, CCTV equipment, and various related products we have available on our website here: Security Camera King. Security Camera King works with other major leaders involved in the security, surveillance, and CCTV industries. Networking allows all of us to support each other, making it easier to meet the different needs of each and every one of our clients. From live video monitoring to technical support, there is no facet of our field we do not cover. This also means we have experience and understanding in helping our clients with any questions they might have. If you are interested in any of the services our partners provide, visit their website for more information. eLine Technology supplies some of the most state-of-the-art CCTV equipment currently available. They also help to design and manufacture products with cutting-edge technology and economical prices. Without them, distributors like ourselves wouldn’t be able to sell high-quality equipment at low-cost prices. TechPro Security is a skilled installation team with an exceptional understanding of how to get the most from security cameras, surveillance systems, and alarm systems on any size property. Located in Boca Raton, they serve the entire South Florida community and proudly help clients choose which setup is best for their property. Digital Security Guard is a private security agency that uses remote technology to provide live video and surveillance monitoring services. They regularly monitor such locations as parking lots, commercial properties, apartment complexes, gated communities, and even private residences. Their services come in custom protection schedules that suit your security needs, including the option for full, around the clock protection. USA Support Team has been recognized recently for their exceptional customer service and technical support. This recognition is in the area of “Client Satisfaction”, which is always their number one priority. They are located in Boca Raton, FL, making them a 100% US-based support team that handles any technical or user-related issues for all of our products. Security Camera King is one of the top wholesale distributors of security cameras, video recorders, and other related surveillance equipment throughout the entire country. Our Boca Raton, FL location permits us to assist and quickly distribute our large catalog of surveillance equipment to the whole East side of the country. Similarly, our Wheat Ridge, CO permits us to take care of the security needs of the West coast quickly. Visit our website to view our thousands of different products. You can see every item we have available in our Sibell Series Collection and compare them with other collections. Please call us toll-free at 866-573-8878 if you have any questions. Or, Contact Security Camera King for more information.